March is finally here and with it a new batch of top modern office chairs available from a wide variety of industry leading seating manufacturers. This new article highlights a few new models as well as some industry favorites sure to be a hit this month! First up, the Triumph Executive Chair by Global Total Office. This modern chair is available in both fabric and leather upholstery options. The broad range of attractive textiles makes this unique seating solution a versatile choice for any work environment. The ergonomic features standard on this chair are simply unmatched. 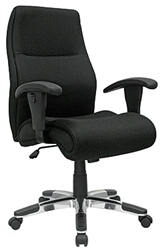 From adjustable arms to a lumbar support knob, this awesome chair is truly an excellent value. When it comes to modern computer chairs, perhaps no brand offers a more extensive range of affordable solutions than Offices To Go. This top modern office seating provider prides themselves on manufacturing high end ergonomic chairs at everyday low prices. For the sake of today's article, the 11648B chair will get the limelight. 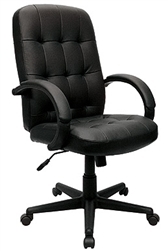 This chrome office chair features a luxhide leather upholstery and budget friendly price of $214.99 with free shipping. 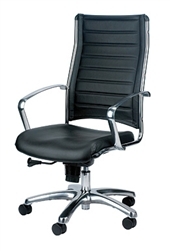 The 11648B chair works well in a variety of applications including the conference room and executive office. Familiar with Eurotech Seating? You should be! 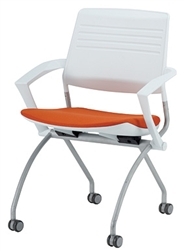 This popular orange and white training room chair offers the modern style desired by most contemporary minded businesses. Priced at $490, this chair is actually sold in a two pack for added value. If you like the Switch Series Chair, your best bet is to call your dealer of choice directly. Additional discount are always available on this model and can save you hundreds. This line of modern training room seating boasts excellent ergonomic features as well as an easy to clean back. Not into the orange? 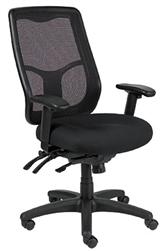 A standard black on black Switch series chair is available with and without arms. If one seating trend has stood above the rest since the start of 2013, it's the use of lime green upholstery! Lime Green Office Chair solutions like the C1BB Commute Chair are an excellent example of this trend at work! This super trendy chair is all business! The durable mesh back design, high end ergonomic features, and in stock status make the Commute series office chair a true winner. Interior designers and consumers alike love this chair as it's also available in a wide range of additional colors to meet the decor needs of any space. Many new businesses are faced with having to acquire multiple new desk chairs to accommodate the seating needs of their employees. That being said, this process is typically accompanied by a strict budget. If this resembles your current situation then the 650 model OFM AirFlo Series Chair is perfect for you. Priced at $179.99, this already affordable line of modern office chairs for sale is available with an excellent bulk discount program for added savings. Choose from 4 contemporary colors and breathe a bit of life into your office. This collection of comfortable task chairs is typically in stock, an excellent feature for those in search of quality office seating in a hurry! Maximizing the potential of your square footage is essential. This is especially true when it comes to business. As we all know, space is at a premium. That being said, understanding the most popular desk shapes available can help you increase your workplace potential without breaking your budget. 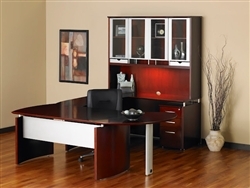 This article highlights several of the top office desk shapes for use in the home or office. Perhaps the most popular style of desk used today are those featuring a U shaped design. 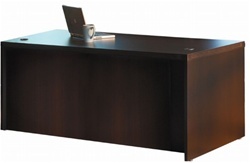 U-Shaped executive desks consist of 3 main pieces that include a desk, credenza, and return. Together these items form the U. This style of desk is a top choice amongst interior designers and consumers alike as it maximizes the overall worksurface available. 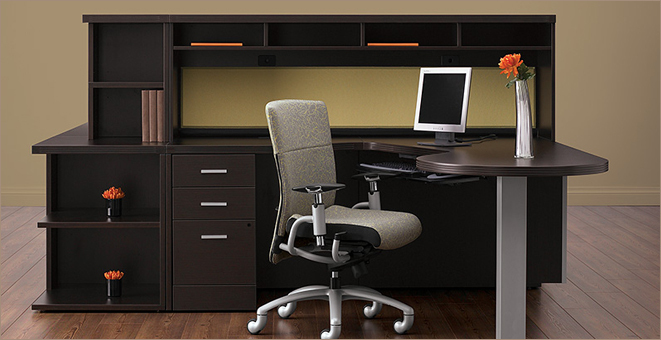 U Shaped office desk layouts work well in open areas, along walls, or in corner applications. 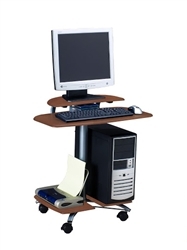 For this reason, they are one of the most versatile forms of office furniture on the market. Another popular style of office desk are those designed for corner applications. Corner office desk solutions are an excellent way to save space without loosing valuable desk size. This form of station is commonly used in smaller office environments and features a modular design. Top corner desks from OFM, Inc. and other industry leading manufacturers like Mayline are the preferred choice of professional designers. No matter the limitations of your space, a corner desk is always an excellent choice as it looks stylish and doesn't lack in terms of workplace functionality. Commonly, Corner Computer Desks are seen in homes and dorm rooms as an alternative to larger workstations. In addition the the two styles listed above, rectangular office desks are also quite common. 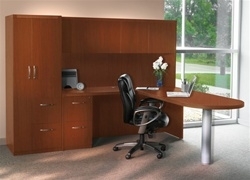 The most basic form of desk, those with rectangular shapes are most typically used in smaller offices looking to grow. For that reason, finding a rectangular desk from a modular furniture collection will allow you to grow your configuration as your space increases. Small home businesses owners will typically start with an individual desk and add components once in a larger office environment. Collections like the Luminary Furniture collection by Mayline are an excellent example. Bow Front Executive Desk layouts also deserve a mention in this category as they feature the same general shape with a little bit of flair. Regardless of your preference, this is an excellent starter solution for any business desking need. Last but not least, Wall Desk units are a relatively new style of configuration that really help to save space and look fantastic. This form of modern office desk is most commonly seen in professional business environments where multiple employees are present. Units like the AT22 Aberdeen Typical make excellent use of areas with longer designs as opposed to those with a wider layout. By adding office storage products like the overhead unit and wardrobe cabinet, desks of this style build up as opposed to out. This takes advantage of a spaces depth without sacrificing the minimal width. Hopefully this article has proven that no matter the limitations of your space, a professional office furniture configuration is available to meet your needs. From high end executive desks to the needs of any small office homeowner, top desk styles and shapes are available for you. When it comes to modern style, Eurotech Seating products by the Raynor Group are amongst the industries best. This modern office chair manufacturer prides themselves on being at the forefront of ergonomic efficiency in the workplace. 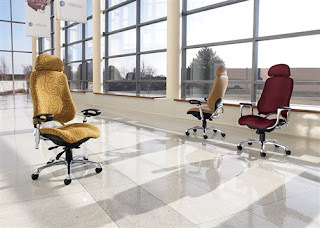 Eurotech chairs offer excellent value, style, and long lasting quality that's sure to keep you comfortable for years. This article highlights several of this industry leading brands top office chairs and the benefits of each. Enjoy! The Eurotech Seating MT3000 Maze chair features a stylish mesh back and contemporary loop arms. 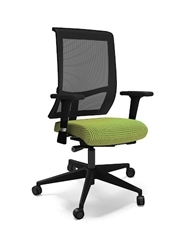 This modern mesh back task chair is an excellent fit for home and business seating applications including the conference room! The VE111 Europa series office chair by Eurotech Seating offers the perfect combination of style and value. 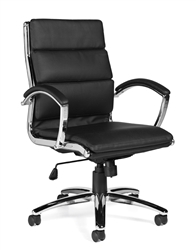 This modern black vinyl executive style chair is perfect for nearly any office application including the boardroom! 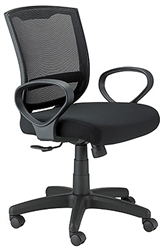 The VE111 chair can be found on sale with an everyday low price guarantee as well as free shipping at OfficeFurnitureDeals.com. Designed and made with the total comfort of humankind in mind. Esthetics, form and function allow this series to utilize a synchro tilt mechanism with infinite lock, sliding seat, pneumatic height adjustment, and headrest option all in one very unique chair. The ME7ERG Ergohuman chair is truly a work of art. 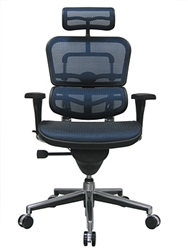 This modern mesh executive chair has revolutionized the seating industry. This particular model is currently under a MAP pricing policy. As a shopping tip, it's always smart to call with MAP priced Office Chairs for additional savings! The Wau chair by Eurotech Seating is definitely an industry favorite. This modern ergonomic office chair offers high end seating attributes simply unattainable by chairs at the same price point. Rest assured, this chair is an absolute winner! The everyday low price and host of high end ergonomic features are nearly impossible to beat by chairs even 3 times the price. This versatile chair is the perfect combination of comfort meeting value! Breathable mesh synchro-tilt backrest and a molded foam waterfall seat are combined with adjustability for out-of-this-world comfort and state-of-the-art control. The Apollo office chair is a huge success in any workspace and offers excellent value for any office seating application. One of the hottest values on the market! The tufted leather Verona executive chair is an exceptional buy featuring roll armrests with padded leather arm caps, tilt tension control, center tilt and tilt lock. This leather office chair wit is the perfect combination of traditional style and modern ergonomics. The Indy Computer Chair is perfect for any home or business office seating application. The sleek design with a polished aluminum base, black treads and tone-on-tone mesh fabric detail combined with swivel tilt, tension control, tilt lock and adjustable arms makes Indy a real winner. No matter the ergonomic needs of your home or business, Eurotech Seating has a chair for you. 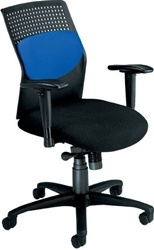 In addition to these top selling ergonomic office chairs are a host of additional models with fantastic style. The Raynor Group has also released an entire line of professional office furniture solutions for executive areas and wood conference room furniture needs. Needless to say, this fantastic company will be setting trends for years to come! Every year a host of new modern office furniture and seating is made available for consumers and business owners alike. Several of these versatile furniture collections make an excellent solution for both home and professional applications. This article highlights the top modern furniture collections that fit this specific criteria, and won't break your budget! Perhaps no furniture line has been more popular over the past year than the Verde casegoods furniture collection by Cherryman Industries. This reputable manufacturer offers a wide selection of furnishings for every room of the office. From tables to desk configurations, Cherryman Industries does it all! However, for modern furniture lovers, the Verde line stands alone. Verde products like the VL-743 modern table desk configuration boast a glamorous look that doesn't like in terms of efficiency. With ample storage and work surface this setup provides excellent value and unbeatable good looks. This popular modular office furniture line has received no shortage of accolades since it's release in 2012. The Zira desking collection boasts a seemingly limitless collection of customizable components sure to work in any size space. Pre-configured desking typicals are available in a choice of 14 laminate finishes as well as 9 pull options. In addition to Zira Typical configuration solutions, a host of matching office storage products are available perfect for the home or business. When it comes to modern office furnishings, no brand offers a wider range of professional solutions than Mayline. This leading furniture manufacturer offers 10 top casegoods furniture lines that all work perfectly in both home and business environments. Discount Mayline furniture solutions like the Napoli series feature a distinct modern look that's hard to miss. This top seller includes a variety of matching veneer conference tables as well as super stylish discount reception desk models to meet the needs of any workspace. 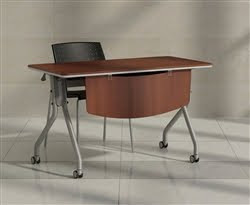 For home owners, Napoli Desk solutions are available in a variety of sizes and 3 finish options. Additional glass wall cabinets and modern wood bookcases are also available for added storage. With a seemingly limitless selection of reception desks available, it's important to educate yourself on the available styles and shapes offered. This article highlights the 3 main desk styles and their features in order to help you make the best and most informed purchasing decision possible. Enjoy! Perhaps no style of reception area desk is more popular these days than those with a curved design. Manufacturers are scrambling to release the hottest new curved front reception desk solutions possible on an ongoing basis. For that reason, the first desk shape to highlight had to be curved. The benefits of a curved station are simple. In terms of space, desks with this shape allow interior designers and consumers alike the ability to maximize square footage potential. Aesthetically speaking, curved desks promote a welcoming feel that is visually appealing to visitors. From the standpoint of privacy, they ensure a secure shape that doesn't leave employees exposed, or their belongings. Manufacturers like OFM, Inc. provide a wide variety of curved desking configurations with modular attributes. Modern Marque series reception stations from OFM solutions are available in single units starting at $993.99. These space saving units are available in three popular finishes that are typically in stock. Marque reception desk units can be added to form configurations large or small based on the needs of your space. OFM, Inc. understands the needs of your growing business and for that reason this collection has been a huge hit. The most common form of desk for the reception area are those with a rectangular shape. These discount reception desk models appeal to those on a tight budget and with space limitations. Additionally, rectangular models can be found in a variety of traditional and modern styles to meet the decor needs of any space. These easy to spec solutions are available from a variety of key furniture manufacturers and offer the simplicity and functionality desired by all businesses. The most valuable benefit of a rectangular station come in terms of space. 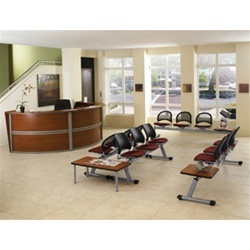 These small reception area welcome desks are typically desired by businesses with limited square footage. In addition, rectangular models are typically offered with the ability to add storage pedestals for added versatility and organization. In some cases, manufacturers will offer units standard with pedestals included for added value. Undoubtedly, this shape of desk is the most affordable. As they are typically the smallest, less materials are obviously involved in construction therefore bringing the price down. However, do not be fooled! Several of the industries best and most popular units feature this common shape and do not lack in terms of style and commercial appeal. When it comes to modern style, Cherryman Industries Furniture from the new Verde casegoods collection is hard to beat. And for that reason, the VL-816 reception station definitely deserves the spotlight when it comes to reception area desks with rectangular design. Available in two rich finishes, the VL-816 station is typically in stock and ready for quick shipment anywhere in the continental US. This modern station is accented with a contemporary transaction counter and luxurious curves. Priced at only $674.99, this unit is an excellent buy. Matching products are also available including modern lateral file cabinets, and a variety of luxury executive desks to create a full an cohesive look throughout your business. For larger reception areas, L-Shaped stations are the most common choice. This form of desk typically consists of a modular reception desk with a left or right return. The two products combine to form.... you guessed it, an L shape. Often L-Shaped units will be available in ADA compliant variations for the needs of handicapped visitors. L shaped desks add to the versatility and functionality typically considered when purchasing new reception furniture for any office. The benefit of an L-Shaped reception unit can be summed up in one word. That word is versatility! These fully functional stations allow for added storage as well as increased usable desk space. L-Shaped models are typically used to accommodate a single receptionist but larger styles are available for multi user applications. The modular design of L-Shaped stations is also an excellent feature. Most manufacturers make stations with non-handed returns that allow you to reconfigure your station based on the needs of your current furniture layout. Almost every top office furniture manufacturer offers L-Shaped reception desks. However, the one brand that stands apart is Mayline furniture. With 10 industry leading casegoods furniture collections available, it's hard to argue their selection quality. Mayline reception desks from lines like Aberdeen, Napoli, and Luminary are long time favorites. Take the NRSLBA wheelchair accessible reception desk for example. This station is perfect for areas requiring ADA compliance and still offers fantastic modern style. For those with more traditional tastes, the SRCSL Sorrento Reception Desk features a luxurious wood veneer construction and marble transaction counter. No matter your preference, Mayline has a solution for you! The importance of office functionality cannot be under estimated. Utilizing modern products like the mobile office tables highlighted in the article are an excellent way to provide your office will effective, user friendly furniture for the needs of a growing workplace. These stylish tables will have your office looking great while improving your day to day versatility and efficiency. When it comes to professional office furniture solutions, perhaps no brand is better known that Global Total Office. This worldwide brand offers a huge selection of modern furnishings for the needs of any office area. For the sake of today's article we will be focusing on the Bungee table collection. This super cool line of mobile tables provides businesses and educational facilities with the modularity needed for multi purpose areas. Bungee modular conference table set solutions like the BXK132S offer consumers the ability to purchase an all in one package of tables that configures to a variety of shapes. For more specific applications, individual and customizable bungee table options are available. Units like the BX2442RES allow users to choose from 11 surface finishes and 2 frame finishes to meet their individual decor needs. 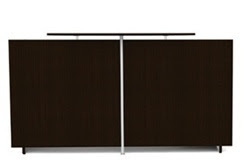 Optional modesty panels are also available for added privacy. Overall Bungee tables are extremely useful in the workplace. This affordable furniture line is easy to install, reconfigure, and add on to making it an absolute value in every sense. 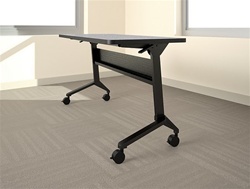 Another brand that's paved the way for the mobile office table movement is Lesro Industries. This modern reception furniture manufacturer has recently branched into the furniture needs for a variety of other office areas in a big way. With lines like the new Mystic office furniture collection, Lesro has created contemporary conference room furniture solutions and seating perfect for meeting areas of any size. The S1948J4 is a perfect example of Lesro's latest furniture achievement. 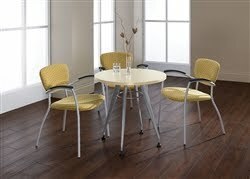 This small mobile meeting table is standard in 6 laminate options as well as 2 frame finish options. The metal legs add durability and a modern look that really impresses. Additional sizes are available to meet the space requirements of any boardroom. Look for the Mystic office table collection to be a huge winner in 2013. When it comes to Mayline office tables with mobile capabilities it's really too hard to choose one collection. 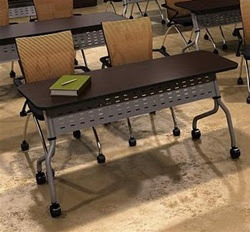 Lines like Sync and Flip-N-Go are both excellent for modern training room furniture applications. That being said, we will provide you with a quick run down of these top two! Let's start with Mayline Sync table solutions! These flip top tables for the training room feature a single handed center control mechanism for a convenient flip of the top. This awesome feature allows for quick and easy nesting. For those unfamiliar with nesting, this awesome attribute makes for simple and easy room cleaning as well as reconfiguring based on the needs of a particular meeting or class size. Sync office table models are available in a wide variety of sizes and finish options. A long time favorite of industry professionals and interior designers, Flip-N-Go training room table solutions offer affordability as well as a huge selection of user friendly attributes. For starters, these modern office tables flip easily and quickly. All models require minimal assembly and are available in two stocked finishes. Tables can be quickly connected together to create modular office furniture configurations with the optional ganging brackets. Additional features include an integrated cable trough and modesty panel along with four locking casters for safety. 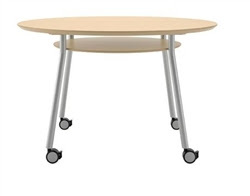 Flip-N-Go modern training room tables are hard to beat in terms of versatility and value. For that reason, they will continue to be a top seller in 2013. February is finally here and 2013 is in full swing. This month has brought a huge selection of top office furniture and seating solutions at discount prices for your home or business. With all the affordable new products available, this article highlights the top 5 items you can't afford to pass up! Are you familiar with Studio Designs? You should be! Their offering of modern drafting tables and art furniture is amongst the industries best. When it comes to affordable drafting products there in stock selection is hard to beat. 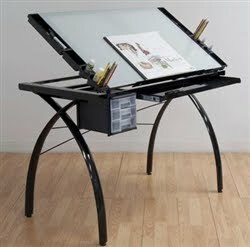 For that reason, the 10071 Futura White Glass Drafting Table is the first product you can't miss in February. Priced at $198.99 this modern drafting table is perfect for beginners and professionals. The 10071 makes an awesome gift and really enhances any space it graces. This stylish table includes 3 plastic molded slide out drawers for added storage. The curved leg design, tempered glass construction, and adjustable top add to the value of this fantastic piece of Studio Designs furniture and you won't see it priced lower than it is this month. Next up, the Mayline 948 computer table. The needs of the smaller office have not gone un heard. This small modern computer desk is perfect for both home and business use. The 948 desk is from the popular Eastwinds furniture collection and is available in a choice of anthracite or medium cherry finishes. With an everyday low price of only $86.99, this unit offers a lot for the money. The built in CPU holder and keyboard platform add to the value of this versatile small computer desks and the free shipping saves you even more. What a bargain! Not all ergonomic office seating is created equal. That being said Eurotech Seating offers some of the absolute best and most affordable desk chairs for the home and business that really impress. 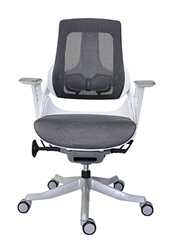 Models like the MTHB94 Apollo mesh chair offer a host of top ergonomic attributes and user friendly features sure to keep you working efficiently all day long. This unique desk chair offers a tilt tension control, tilt lock, waterfall seat edge, and width adjustable arms all for a price of only $199.99. The breathable mesh back and pneumatic seat height adjustability are also worth noting. Quite honestly there are very few if any comparably priced seating solutions on the market with this wide a selection of features for a price this low. The MTHB94 is an absolute steal. If one area is receiving a makeover more than any other in 2013, it's the break room. This month a host of meeting tables from Global Total Office are on sale now to meet the needs of this important office space. Units like the GC36CF are a great example of the deals available today. This modern round break room table features a commercial look that appeals to the needs of most contemporary businesses. Interior designers and consumers alike love the GC36CF as it's available in 10 laminate surface finishes and 2 frame finish options. Priced at $286.99 you'll be hard pressed to find comparable modern bistro tables with this much style! Last but certainly not least we arrive at the BT30 Brighton Typical by Mayline. As with all modern Mayline furniture, this Brighton series office typical meets all reception area needs in one simple package. 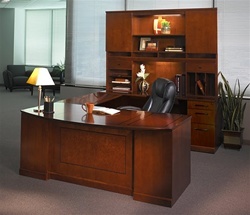 BT30 reception area furniture sets include ample storage, desk space, and incredible appeal all for $1700.99. This 6 piece Mayline Brighton desk configuration is available in 2 unique laminate finishes and includes free shipping. The Brighton casegoods furniture collection is typically in stock, a nice feature for those in need of discount business furniture in a hurry. Additionally, the Brighton series includes a variety of discount executive desks and modern conference room furniture solutions to enhance every room of your office. The best part, the entire collection is on sale through February. Enjoy! The seating industries hottest new office chairs are available now. The new year has brought a multitude of ergonomic seating solutions for the home and business. With so many new models to choose from, how do you save the most money and find the best deals? This article highlights several key shopping tips to keep in mind when shopping for modern office chairs. The words modern and ergonomic are like two peas in a pod. When it comes to ergonomics, it's all about knowing your body. Before shopping for a new chair, take the time to determine the ergonomic chair features that will work best for you. While most modern seating solutions feature a variety of standard ergo friendly features, many feature high end attributes that can cost you money. How do you know what features will work best for you? Meet with an industry professional or chiropractor. They will be happy to discuss the benefits of popular ergonomic chair features like lumbar supports, headrests, pneumatic seat, and adjustable arms. A simple question to ask yourself is, "Will this chair feature increase my workplace productivity". If the answer is no, it's probably not worth spending money on! There are a seemingly limitless number of seating manufacturers available today. Some specialize in traditional chairs and others more modern varieties. No matter your preference, set a budget before shopping. Once you've determined your individual price range, take a moment to call a few top online seating providers. By asking for office chair brand recommendations in your price range you'll already be armed with more knowledge than the average consumer. Basing your purchase on looks alone is definitely not the best way to save money. Some of the industries best and most respected seating manufacturers include OFM for big and tall ergonomic office seating as well as executive computer seating. Another top brand is Eurotech Seating. This high quality ergonomic chair provider offers a host of affordable luxury chairs designed specifically around versatility and efficiency. Thirdly, Offices To Go chairs offer in stock seating solutions including mesh back desk chairs and other contemporary styles. There products are fantastic for those looking for a new chair in a hurry. Manufactured by Global Total Office (another top brand) they offer excellent quality at extremely competitive prices. Once you've chosen a brand, it's time to find a reputable dealer. Search for specials, deals, and coupons online at sites like tjoos.com and RetailMeNot.com. You'll be surprised just how much you can save in the few seconds it takes to do a search. As a rule of thumb, if you see a "enter coupon code" box during checkout, the odds are coupons are available! Finding coupons should also be a major factor in choosing a dealer... but not the ultimate one. Discounts are great but consumer reviews are priceless. Search engines like Google are adding reviews next to products in their new comparison shopping engine that provide excellent insight on the dealer you might be considering. While one chair might be a few dollars cheaper at site A, site B may have a far better seller reputation which is of premier value. Choose a reputable office chair provider that values you as a customer and looks to make you a customer for life, not just a quick sale. In conclusion, regardless of what you're shopping for online it's important to do your homework. It's easy to save money on a variety of quality office furniture and seating if you know where and how to look effectively. Utilizing comparison shopping engines, coupon sites, and dealer review sites, are an excellent way to get you started when purchasing anything from large executive furniture to smaller items like ergonomic monitor mounts. No matter your shopping need, any quality dealer should be willing to help identify your needs and assist with space planning and ergonomic benefits to help improve your daily work experience.